Celebrating 5000 days of MapleStory with an Orchestra Remake of the best OST tracks! Performed by Hungary's oldest orchestra & recorded in the heart of Budapest. Rearranged for Orchestra and produced by ASTERIA. "We spent the whole remaining 2016 budget of Nexon's Sound division on this project! And most of us had to work in Hungary for 2 weeks. Budapest is marvellous by the way. 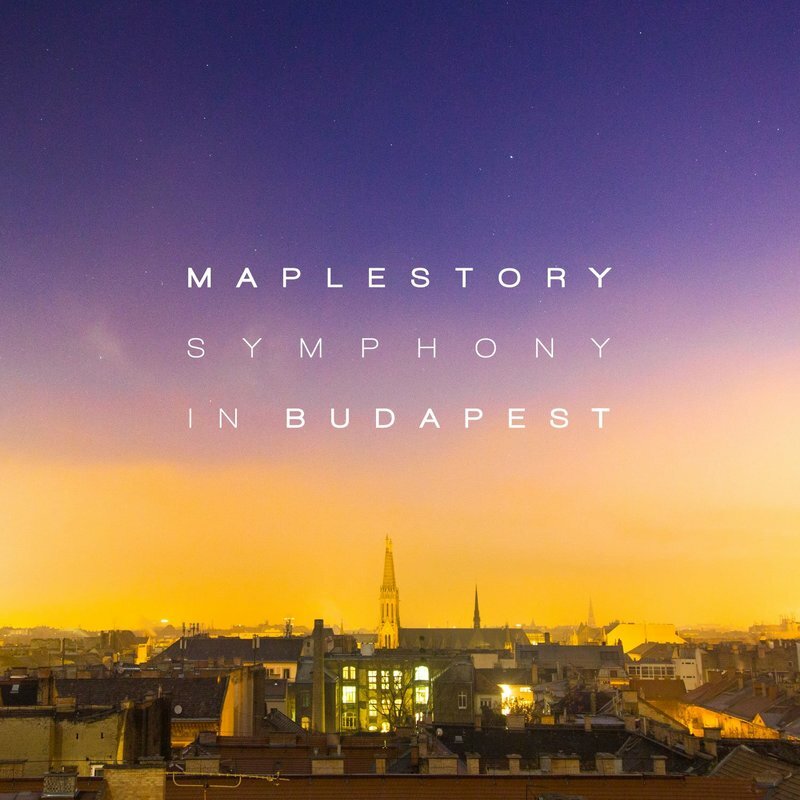 - NECORD MUSIC"
The beloved and renowned music of MapleStory is finally reborn in a high-quality, full orchestra version recorded by the Symphonic Scoring Orchestra in Budapest – a city full of history, beautiful architecture and European romance. In total, there will be 12 masterpieces in serial order! It is the music that greeted you in the teaser video which informs the start of this orchestra album. The theme song of 'Ellinia' map, the original melody was delayed and the effect was impressive and unique. But on this album, we made a bold attempt to reinterpret everything except the melody. It's like a classical music reminiscent of classical music with a sacred feelings that are completely different from the original song. It is a song that feels the elegance and majesty of the female actress in elegant, powerful melody with the theme of the boss of 'Cygnus' in the future, 'Cygnus'. Waltz unique old-fashioned feeling met the symphony performance, did not you reborn in a more beautiful appearance? One of the newly recorded tracks is 'Start the Adventure', a tune that players hear at the start screen of the game ever since the first MapleStory release! Aren’t you curious to find out how this track will bring back old memories? This is a NEW song which is not released yet, it's from the new 4th region of Arcane River: Arcana "Mysterious Forest"! The mysterious feeling that flows through the tunes reminds me of the feeling of shyness spirits in a dense and majestic green forest. Like the flowers that grow with raindrops, it contains the freshness of the newborn knights who constantly devote themselves to training. This is the main theme song of Ereve island 'Ereve'. It has a calm atmosphere that seems to envelope your heart warmly, and it feels comforting to hear it. The ensemble is a remarkable piece of music as the music is transposed in the latter half of the year. What if there's a village where everything is made of toys? The theme of "Ludibrium" was revived in a brilliant orchestral waltz style! The main theme of MapleStory's first blockbuster 'Black Heaven'. You can feel the deep impression when you pass through the climax section that stirs up the calm and beautiful melody. The theme song of the Clock Tower of Nightmare is a popular dream city of Arcane River region. Through this project, it was reborn as an epic style orchestral music. Lucid's insecure inner self is deeply concealed in the mind while drawing the city of a festival that stayed on forever, by arranging the original guitar composed of electric guitar, filtered rhythm and dreamy piano melody with magnificent percussion and orchestral arrangement expressed. It is the theme song of the legendary Phantom of Maple World, his personal 'Crystal Garden'. This album is full of originality and excitement, but thanks to its classical and elegant appearance, it is filled with diversity. The melodious and fast beat that rides through the tunes meets the large orchestra and shows a strong and dynamic energy. MapleStory content "Masteria Through Time" with it's music that had been loved by overseas players have been revived! This song, which means "An Eternal Breath" is a track that sings Latin love and agony that does not change even after a long period of time. ​MapleStory content "Masteria Through Time" with it's music that had been loved by overseas players have been revived! This song, which means "An Eternal Breath" is a track that sings Latin love and agony that does not change even after a long period of time.